What can a garden add to your home? Have you started thinking about your garden over winter and thinking it’s time to get it ready for summer? You want it to be an extra ‘room’ on the home and become a great place to entertain friends and family? Not sure what to spend on the garden transformation or know what value it will add to your home? So, what value can a great garden add to a property? Approximately 20% to your property value! 20% added value is around £60,000 based on the UK average home price! That’s a huge gain when you decide to sell yet many homeowners fell that they don’t want to spend lots of money on this space. It’s madness! Outdoor spaces are today being seen as ‘extended living rooms’ and a well-designed and maintained garden are high on home buyer’s lists of requirements. Homeowners should look to spend the same amount of time and effort on their outdoor space as they do when decorating their interior spaces. All these things are to be considered when planning your perfect garden space not forgetting the design elements; what materials you want to use, what colours you like, what would complement the house and how long do you want to spend maintaining the garden (if you are anything like me not long at all!). 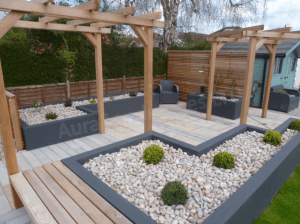 We have designed and built many garden transformations over the years and some have been award winning. Imagine if your garden was deemed award winning – how smug would you feel showing it off to your friends and family. Particularly if being in the newly transformed garden brings a smile to your face – that’s priceless. WOW isn’t for everyone but if it’s for you a design to envision your dream garden space is key! It can also add thousands to the value of the property when you sell it. So what do I need to think about for my garden to add the most value? Low maintenance – this is key when looking to sell your home. Choose materials that are easy to maintain i.e. ceramic outdoor slabs, get rid of wood decking, think about the plants you want to add (are they easy to care for), is artificial grass a consideration? Outbuildings/sheds – adding one of these to your garden can act as affordable living space and add value. Perhaps a garden office, guest room or gym? Set defined spaces – what area of the garden gets the most sun? Here you would want to create a patio and seating area to enjoy the sun (while it lasts). Do you want a quiet reflective space away from the home with plants and water features? Maybe a fun games area for the kids? How does each area connect (pathways and walkways) and how does the garden flow from each area? Why should you be thinking about Summer and your garden space now? The best gardens are thought through, envisioned and designed in the cold months of Winter then executed in the Spring/Summer months! Decided the investment is worth it? Great, here’s what to do next! Start to look at products! Look at Pinterest for some inspiration and start creating your garden vision board of images you like, products, colours, furniture etc. For stone products we suggest looking at sites like www.marshalls.co.uk, as they produce quality products that are built to stand the test of time. Search these websites for installers in your local area. Look into their portfolios and previous projects to get a feel of the standard of their work. 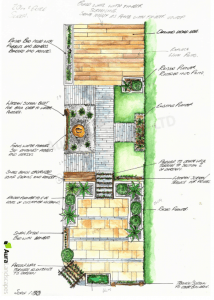 although this is not crucial, having a design may help you envisage your dream garden more easily, and both you and your chosen landscaper will know exactly what to expect at the end of the project.